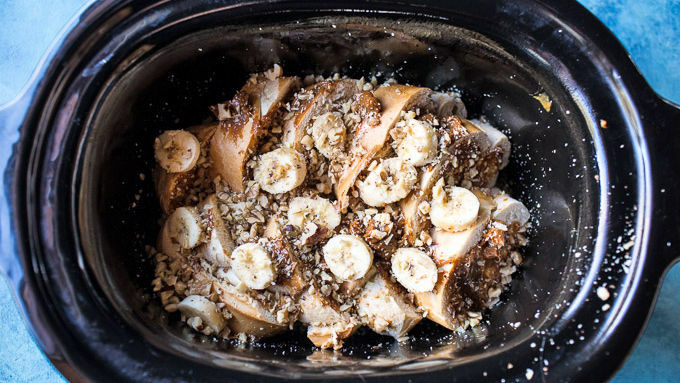 Spray slow-cooker with cooking spray. Spread caramel sauce on each piece of toast and layer toast in slow-cooker. Top with sliced bananas and chopped walnuts. In a bowl, whisk together eggs, milk, cinnamon and vanilla. Pour egg mixture over the slices of bread, making sure the eggs moisten all of the bread slices. Place pats of butter on top. Cover and cook on High for 1 1/2 to 2 hours or on Low for 3-4 hours. 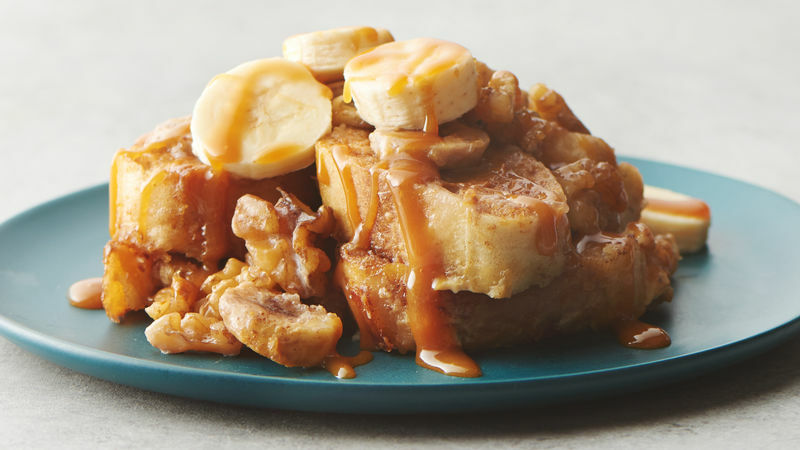 Serve with additional fresh bananas and warm caramel sauce or maple syrup. Enjoy! For a sweeter version, try using Nutella™ in place of the caramel. This toast can also be baked in a 9x13-inch pan in a 375°F oven for 30-35 minutes. Are you ready for the ultimate breakfast/brunch recipe? 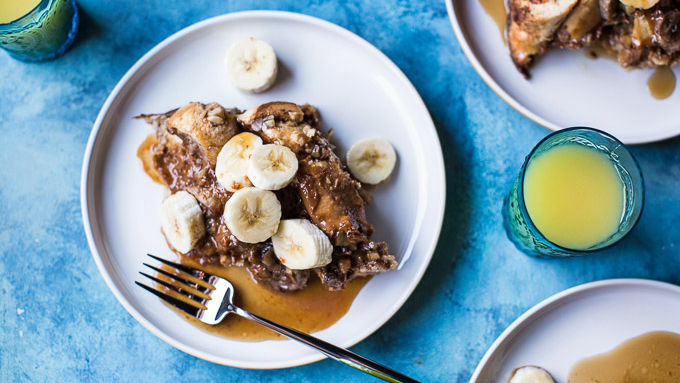 This caramel French toast is everything you want... and then some. I love this recipe for so many reasons. For one, it's made in the slow-cooker which has many advantages: Freed up space in my oven and on my stovetop, minimal mess and clean-up, AND I can just set it and forget it. Totally perfect for a midmorning brunch with friends or family! ?Reason two: simple, classic and delicious flavors. I mean, it really doesn't get better then bananas and caramel. They are perfectly sweet together! Reason three: I have yet to meet a person who does not fall head over heels for this French toast. It's truly an all-around winning recipe. Yes!! For a sweeter version, try using Nutella™ in place of the caramel. This toast can also be baked in a 9x13-inch pan in a 375°F oven for 30-35 minutes. 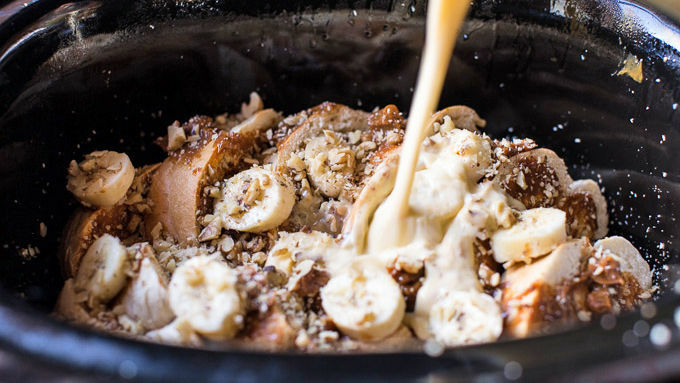 Serve hot with warm caramel sauce or maple syrup, plus additional fresh banana slices.